How can we help you celebrate? Please leave any questions you have about birthday parties and what dates you may be hoping for? The facility can accommodate up to 40 guests. Parties start at $175. If you want more activities than yoga the price will go up depending on the amount of product is needed and time investment. Please use contact form above to inquire about dates and other details. You don't have to be a kid to have a fun yoga birthday party with your friends. We can accommodate a style of practice and the length of practice that you and your friends would like to do. There can be meditation, intention settings, dancing, eating and just socializing too. The studio can accommodate 25 adults max to practice. 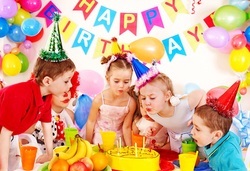 Kids yoga parties are a fun and unique way to celebrate your little yogis special day. We will organize your event and create a customized party coordinated around your theme. Have the whole facility to yourselves for two hours. Kid's can play in the kid's room and the yoga room too. Limber will provide a 20-40min yoga practice and then convert the yoga room into a fun play room and or a place to eat, open presents, and play games afterwards. Choose a theme from ideas below or create your own and we will help to accommodate. Parties start at $175. Fill out the form below or call 206-963-8973 and let's start planning your kid's party today. Have your guests come dressed as princesses or we can use our imaginations and become princesses through play. We could create magical wands or tiaras too. Let your child dream up their magical day. Lions, Tigers, and Bears Oh My!! If you have an animal lover on your hands we can have a wild party. Guests could bring their favorite stuffed animals to the party too. We could turn everyone into an animal by face painting, or making masks, or even fabric tails. We can turn our place into a farm, zoo, or just the wild outdoors. Let's see what we can create together. Your child and guests could go to the moon in their very own rocket ship. They could sculpt clay into planets or aliens or create their very own star constellation.